With some laughs still in play and the entire original cast still an integral part of the show, Modern Family has a lot going for it, which is probably why it has at least two more seasons. A good run for a television show is about four to five seasons, so when you have one that is still going through Season Eight with renewals for another two seasons, you know it's a quality show. When that same show has been nominated every year for an Outstanding Comedy Series Emmy and has won the award five out of Eight years it speaks volumes as to the production and popularity of the show. Modern Family has this unique distinction and it is well deserved. While it isn't enjoying the same level of viewership it originally had, it is still a top half-hour television comedy. 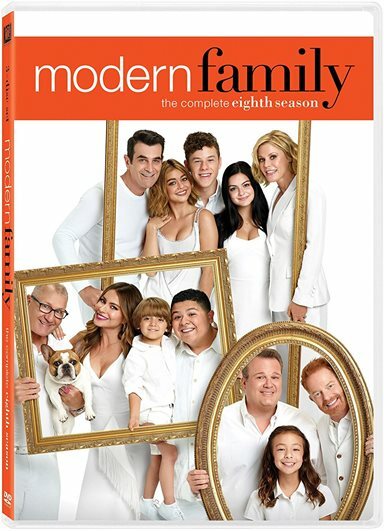 As Season 9 is set to begin at the end of September, Modern Family: The Complete Eighth Season is now available for purchase. Every family is somewhat dysfunctional with overbearing parents, annoying siblings and just a general atmosphere of frustration and anxiety. However, for the Dunphreys and Pritchetts the dysfunction takes it to a whole new level. With three sets of related families, they manage to hit many of the major groups we come across in today's Society. Claire (Julie Bowen; Happy Gilmore) and Phil (Ty Burrell; The Incredible Hulk) are the traditional husband and wife with kids, Jay (Ed O'Neill; Married with Children) is the Father who divorces the mom for a younger woman and now has his second family and Mitchell (Jesse Tyler Ferguson: Untraceable) and Cameron (Eric Stonestreet: Almost Famous) are the Gay couple who has adopted. After taking their separate vacations, they all come home to more angst and drama. Both Manny (Rico Rodriguez; Epic Movie) and Luke (Nolan Gould; Friends With Benefits) are entering their senior year and the competition is fierce between these two. Claire takes over the family business and Jay and Phil start a business venture that ends up going south. Cam and Mitch suffer more relationship drama with their insecurities, which seems to be an ongoing theme every season. What this show has going for it is the cast. O'Neill has never been better and with Sofia Vergara (Four Brothers) playing his younger, Latina wife, they manage to have some funny interactions. Bowen and Burrell seem to be a good fit but their connection isn't as strong. Stonestreet and Ferguson are the strongest of the couples and their banter is also good for some laughs. The kids on the show are generally solid but newcomer Aubrey Anderson-Emmonsis terrific as Cam and Mitch's daughter, Lily. The problem with the show is it suffers the same fate as most long-running sitcoms in that it is difficult to maintain the same level of jokes and humor as when the show first aired. Some of the funnier bits are recycled and don't seem to pack the same punch as they did previously. That isn't to say there aren't some laugh out loud moments because there are. There just aren't as many as there was when the series began. The Complete Eighth Season does offer some great guest stars, including a very funny stint by Niecy Nash (Reno 911!) whom I always seem to enjoy and the return of Fred Willard (Harold and Kumar Go To White Castle) as Phil's Father. Other guests this season are Peyton Manning, Benjamin Bratt (Law & Order), Elizabeth Banks (Pitch Perfect) Kelsey Grammer (Fraiser), and Victor Garber (Buffy the Vampire Slayer) to name a few. With some laughs still in play and the entire original cast still an integral part of the show, Modern Family has a lot going for it, which is probably why it has at least two more seasons. However, with it losing some steam and viewers, it will be interesting to see how much longer it can maintain the level of comedy audiences have enjoyed in the past. For now, though, there are still some good times to be had from the blended family sitcom. At least they make the rest of our families seem somewhat normal. Download Modern Family: The Complete Eighth Season from the iTunes Store in Digial HD. For more information about Modern Family visit the FlickDirect Movie Database.